For 60 years, Storybook Land has been keeping the spirit of childhood alive in an entertaining and educational atmosphere. We invite you to relive your childhood while introducing the innocent themes of wonderment to an entire new generation. Your children's ' and grandchildren's ' memories will be with them throughout their lifetimes! The timelessness of childhood will ring true as your family literally walks through its all-time favorite stories and nursery rhymes at Storybook Land. 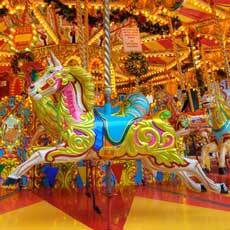 Children's classics are interspersed with exciting new family rides and attractions in a remarkably clean and enjoyable park setting. Join us several times a year for memorable family experiences. You are certain to enjoy your visits! The rides at Storybook Land - like our entire park - are clean and impeccably maintained, with ride operators who are trained to take the time to insure your child's comfort and well being. If this is your child's first visit to an amusement park, you can be certain that it will be a very positive experience. Equally important, if you have visited any of the country's theme parks for small children, we think that you will agree that a visit to Storybook Land is unsurpassed either in terms of quality or good old fashioned fun! Storybook Land has been family owned and operated since its inception back in 1955. Through continuous improvements, the family's commitment toward families like yours has remained nothing less than a top priority.